A while back I discovered Jamie Oliver’s chicken baked in milk, and my entire world as it related to chicken was rocked forevermore. The tenderness! The flavor! The gorgeous, delicate sauce! I couldn’t believe it/stop talking about/stop dreaming about it. The only teeny tiny issue was that it takes a couple of hours to prep and make, which is totally doable on a lazy Sunday afternoon, but not so much on a busy weeknight. And so I started scheming about how to get some of the baked chicken wonderfulness, but in a quicker, weekday-friendly way. Please meet chicken poached in milk, your new weeknight chicken best friend. The baked chicken calls for a whole chicken, and the key to this one is that you are using boneless chicken breasts, and you are simmering it on the stovetop instead of baking it in the oven. It still calls for the lemon that makes the Jamie Oliver version so wonderful, but it adds a little sour cream to the mix to help thicken up the milk gravy just a tad. And since I was going for weeknight simplicity, I decided to add in some veggies while I was at it, in the form of baby carrots and tender, sweet leeks. They all simmer up together in milk until the chicken and veggies are tender. Once everything is cooked, the chicken gets scooped out and shredded into bite sized pieces – shred it rather than cutting it, so that you have nice ragged edges to catch the sauce. And speaking of the sauce, it gets made by whisking a little sour cream and mustard into the milk to give it a little extra flavor and substance. Once this is done, all you have to do is serve things up! 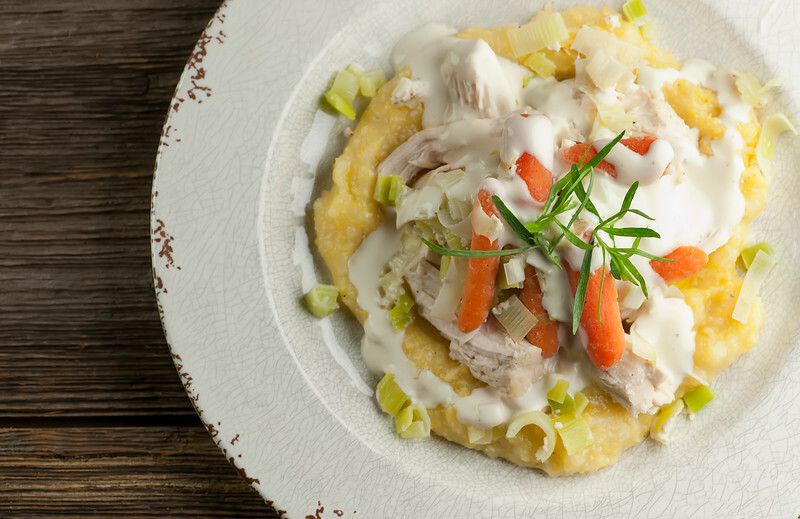 I piled my chicken and veggies on to a plate of polenta and poured the sauce over everything, but you could serve it over rice, pasta, or just by its wonderful self. I had a bunch of cheery tarragon in my fridge, so I toped it off with a few sprigs of that. The whole thing took about 20 minutes, and was a nice speedy alternative to the glorious baked chicken. So the next time you gave a hankering for chicken comfort food extraordinaire but want it NOW, grab your carton of milk and give this a try! Place chicken, carrots, leeks and lemon zest in a heavy deep skillet. Pour milk over the chicken. Bring to a simmer over medium heat. Cover and cook until the chicken is cooked through and the vegetables are crisp tender, about 10 minutes. Place a colander over a bowl and pour the chicken and veggies out into the colander, keeping the milk in the bowl. Quickly tear the chicken into bite sized pieces. Add back with the veggies. Whisk the sour cream and mustard into the milk. Taste and season with salt and pepper as needed. 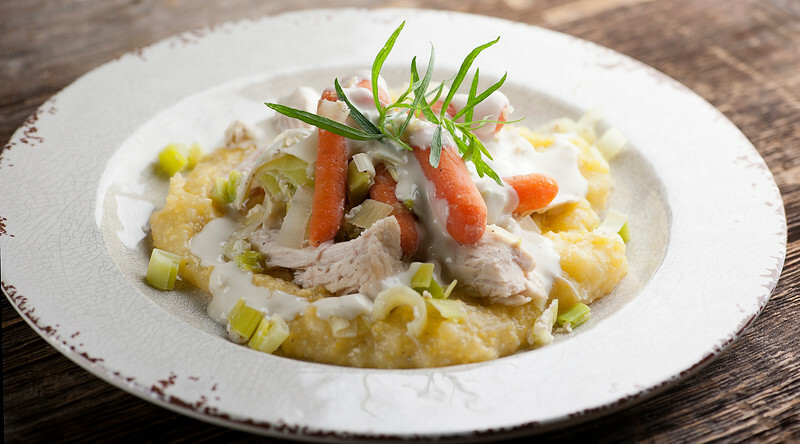 Ladle the chicken and veggies onto a bed of polenta or pasta or rice, or directly onto the plate. Drizzle the milk sauce on top and garnish with tarragon. Serve at once. This chicken definitely sounds like the perfect comfort food, Kate! I’ve never heard of poaching it in milk before, but I love the looks of it. Sounds delicious! My mom used to do what she called “potted chicken,” which was essentially chicken cooked in liquid. Not milk, but I can see how this would be super tender! As always, looks amazing! i haven’t tried this, though my brother was given some bear meat and told to poach it in milk for best results. as i understand it, the bear was still nasty, but i think chicken would taste amazing like this! Do you think this might work in slow cooker..als thinking about poaching in coconut milk? Hmmm – I think it would be worth a try, although I’ve never tried it that way. If you try it, I would leave the lemon out and stir it in at the end, just so the milk doesn’t separate. Poaching chicken in milk is so intriguing!!!! and I love Jamie Oliver so I’ve got to try this! love!!! If you love Jamie you will love this – he’s such an inspiration! How is anyone supposed to read this recipe, written in spindly, light-gray type? This may be fashionable or trendy, but it’s a pain to read, nonetheless. Hi Rusty! Why don’t you try the version on Jamie Oliver’s site? Hopefully that one will be easier for you to read. Have a great day! Years ago I learned from my partner poaching in evaporated milk. It makes it’s own lovely sauce, Cook chicken covered till done, then reduce the liquid till thickened. Wonderful, sour cream unnecessary. Hi Charles, and thanks so much for this tip – I am definitely going to try it! !